We do not use hollow point bullets. They are against the Geneva convention. Theres alot of trouble with that. I can't find any part of the Convention that states anything about caliber or types being used, but then again I can't even find the whole thing. The Hague convention of 1899 prohibited the use of dum dum bullets. Now I regularly get to use the SA80 MK2 and with the optical sight on it it will take a lot of beating. The SA 80 has a very good range, and even the shorten version is accurate up to 400 yards and is still very good at 500 yards. Yes there were problems when this rifle was first brought in to service just like M16 but these problems are now behind it. 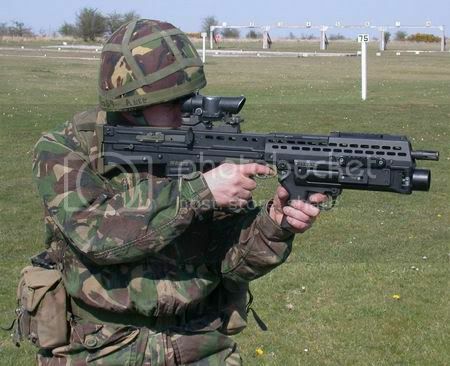 The SA80 has also now being fitted with a 40 mm grenade launcher which has a range of over 300 yards, and they reckon you can put a grenade through any window of a house that you chose to shoot at over a hundred yards. Now many people that criticise this rifle have never fired or used it. I personally find it is a well balanced weapon that is compact and easy to use and clean with good hitting power. Now I see some people are complaining that it is difficult for left handed people to use well so is nearly every other weapon. Even the old LeEnfield were not designed for left handed people but they all learnt to use them and use them well, so what has changed can't they learn any longer to weapon that is made for right handed people. Our latest Assault rifle Type89. Supporting machine gun Ｍ249 price19000dollars. Ｉ think ,they are too expensive. Looks a bit bulky...any idea how it works for range use? How about field? where does the Mosin Nagant sit in that?